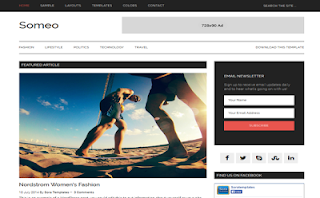 Someo Responsive Blogger Template is a blogger template which is ready right out of the box to display your content like the biggest, baddest magazines-turned-websites do it. Just on the home page you can feature your top stories, include stunning photography as a featured article image, and easily partition your layout for the individual topics you publish content about. Single pages are laid out to focus attention on your name and your words, with several sidebar layouts to choose from so you can optimize ad performance and maximize click-throughs to other sections of your site.